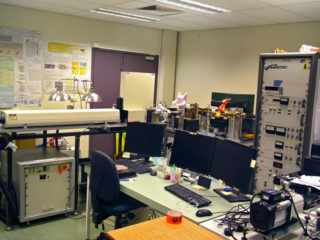 The Western Australian Argon Isotope Facility (WAAIF) specializes in applying the 40Ar/39Ar technique to any rocks and minerals that contain K (e.g. hornblende, sanidine, plagioclase and basalts). The 40Ar/39Ar dating method is used to measure the age and timing of a large variety of geological processes, from meteorite samples as old as the Earth (4.5 billion years) to the age of historical events such as the Vesivius eruption (79 AD). 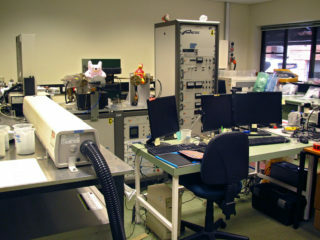 The facility focuses on the application and development of the 40Argon/39Argon chronometer to establish temporal constraints on a large variety of geological processes including the eruption of large igneous provinces, the formation of impact craters and the thermal history of meteorites. 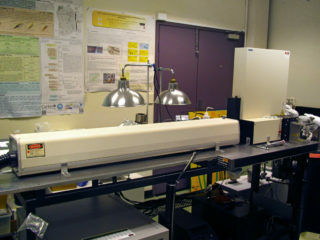 The lab also accommodates an impressive breadth of geoscience-related research topics (e.g. ore deposits, metamorphic petrology, provenance studies). Micas – muscovite, biotite, phengite. Pyroxenes – e.g., found as inclusions in diamonds. Evaporites – sylvite, carnallite, polyhalite, langbeinite. Manganese oxides – cryptomelane, hollandite. Feldspars – K-feldspar and plagioclase. Whole rocks – volcanics, slates, phyllites. Glass – obsidian, tektites, pseudotachylite. Tourmaline – Shorl, Dravite, Elbaite. Alkaline minerals – Wadeite, priderite, K-richterite. 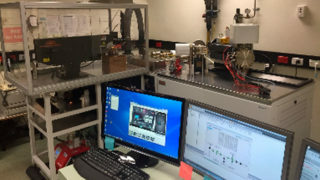 The WAAIF is equipped with A MAP215-50 mass spectrometer with a low-blank automated extraction system coupled with a NewWave Nd-YAG dual IR (1064 nm) and UV (216 nm) laser, an electromuliplier detector and Niers source. The ultra-violet laser is capable of high-resolution (up to 10 µm beam size) ablation of any mineral, allowing detailed analysis of individual mineral grains. The infra-red laser (continuous wavelength 60W) is capable of spot analysis (100-300 µm spot size), single grain total fusion, and incremental laser step-heating of K-rich minerals and whole rocks. For larger aliquot of minerals (> 8-10 mg) we use an automated Pond-Engineering low-blank furnace. The facility is automated and can be controlled remotely via VNC iphone technology. The extraction line is associated with a Nitrogen cryocooler trap and two AP10 and one GP50 SAES getters that altogether allow purifying the gas released by the sample during laser heating. The 40Ar/39Ar method is used to date a myriad of geological events such as volcanism, tectonic plate movements, mountain building rates, sediment formation, weathering and erosion, hydrothermal fluid movements, and alteration and diagenesis of minerals. Timing of volcanic eruptions and magmatic episodes. Dating igneous rock crystallisation ages and thermal histories. Determining ages of terrestrial impact craters. Dating of sediments: sedimentary provenance studies. Determining thermal histories of metamorphic rocks. Dating meteorite and lunar samples. Dating of hydrothermal and alteration events. Dating of authigenic growth events. Determining ages and thermal events of sandstone feldspar cements. The Facility recently acquired an ARGUS VI (Thermofisher), a new generation low volume Multiple Collector Noble Gas Mass Spectrometers (MC-NG-MS) equipped with 5 faraday cups and one CDD multiplier that has recently become commercially available, offering three advantages. Their first advantage is a better sensitivity of the new generation of CDD electron multipliers and 1012-ohm resistor faraday collectors. This allows the measurement of a larger dynamic range of Ar ion beam signal on much smaller (and thus likely purer) and younger sample aliquots. Their second advantage is the ability to measure the 36Ar on the CDD multiplier while other masses are measured on the faraday detectors, resulting in analytical precision one order of magnitude better than with previous generation instruments. Their third advantage is much faster sample analysis (i.e., 30-35 analyses/day compared to the current 10-12 analyses/day for single collector instruments. A new dedicated low volume Noble Gas extraction line capable of collecting and cleaning the gas extracted from a variety of samples, using a PhotonMachine CO2 laser capable of delivering a homogenous laser beam of up to 6mm wide, is attached to the ARGUS VI mass spectrometer. Timing of large (and small) igneous provinces (e.g., Karoo-Ferrar, Kalkarindji, Deccan, Ethiopia-Yemen, Newer volcanic province). Thermochronology of basaltic achondritic and chondritic meteorites and particles from asteroid Itokawa (impact history, eruption age, exposure to cosmic ray bombardment). Technique development (e.g. the terrestrial 38Ar cosmogenic dating technique).